It makes sense. The anxious mind races with often uncontrollable worry and fear. Mindfulness calms and quiets the mind. Therefore, mindfulness will quiet anxiety. It’s a reliable truth, clinically proven by research and experientially proven by mindfulness gurus and ordinary people alike. That said, it’s not a quick fix. It’s a process of becoming. I remember suffering through a yoga class years ago. I didn’t suffer because I was ridiculously inflexible (I am, but that wasn’t the problem). It was painful because I couldn’t get my mind to shut up and experience the peace of the class. I kept telling myself that I should be still, that I shouldn’t be thinking of the million other thoughts and worries that were whirling around my mind. When it came time for the final relaxation, my mind and body were so agitated that I could barley lie still on the mat. The only thing that prevented me from jumping up and bolting out the door was that I was on the far side of the room, trapped by a sea of calm bodies that I was unwilling to disturb by leaving. So much for mindfulness. And in the wee hours of the morning when I would toss and turn and ruminate over mistakes both past and future? I simply could not still my mind and be present in the moment. Of course, this failing added fuel to my fire of anxiety that burned within. Mindfulness, when practiced regularly, is effective in reducing anxiety and increasing mental health and wellbeing. Mindfulness frees us from anxiety and so many other mental health challenges, including daily stress. The healing power of mindfulness lies in its ability to create a shift within us. When we are mindful, we gently turn our attention away from our anxious thoughts and emotions. Rather than fighting with them, we softly replace those thoughts with something different. Anxiety feeds on itself and grows ever bigger in our thoughts. Those anxious thoughts restrict our actions, what we think we can or can’t do in life. This in turn affects our way of being with ourselves and the world. When we live mindfully in every moment we are in, fully present with life in each little bit of it, anxiety shrinks. What we pay attention to grows, and what we don’t attend to withers. Mindfulness means letting our anxious thoughts be and paying attention to other things around us. It means using all of your senses re-focuses your attention. What do you see, hear, smell, feel, and taste (this last one isn’t always practical—licking things around you isn’t desirable)? In activating all of your senses and paying attention to them, you invoke the power to simply exist in the present moment and to quell anxiety. When you practice mindfulness, your anxiety begins to wither, and your sense of peace grows. Practicing mindfulness creates the stillness that allows you to create your own quality life, your life worth living. Learn how to use mindfulness to reduce anxiety and make mindfulness a part of your peaceful way of life. 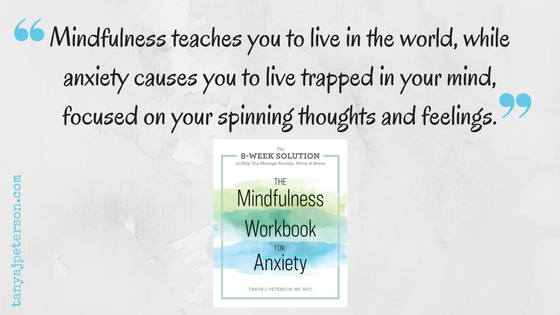 The Mindfulness Workbook for Anxiety is available for pre-order now (and available on May 15, 2018).